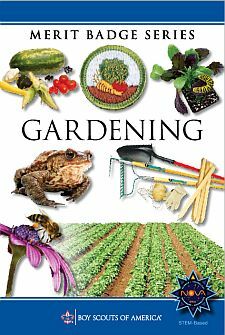 Explain to your counselor the most likely hazards associated with gardening and what you should do to anticipate, help prevent, mitigate, and respond to these hazards. Discuss the prevention of and treatment for health concerns that could occur while gardening, including cuts, scratches, puncture wounds, insect bites, anaphylactic shock, heat reactions, and reactions from exposure to pesticides and fertilizers. Grow six vegetables, three from seeds and three from seedlings, through harvesting. Grow six flowers, three from seeds and three from seedlings, through flowering. Three root or tuber crops. Three vegetables that bear above the ground. Test 100 garden seeds for germination. Determine the percentage of seeds that germinate. Explain why you think some did not germinate. Visit your county extension agent’s office, local university agricultural college, nursery, or a botanical garden or arboretum. Report on what you learned. Explain to your counselor how and why honeybees are used in pollinating food crops and the problems that face the bee population today. Discuss what the impact to humanity would be if there were no pollinators. Identify five garden pests (insects, diseased plants). Recommend two solutions for each pest. At least one of the two solutions must be an organic method. Build a compost bin and maintain it for 90 days. Build a vermipost bin (worm compost bin) and maintain it for 90 days. Build a hydroponic garden containing three vegetables or herbs, or three ornamental plants. Maintain this garden through harvest or flowering, or for 90 days. Build one water garden, either in a container (at least 12 by 6 inches and 6 inches deep), or in the ground as a small, decorative pond no larger than 6 by 3 feet and 24 inches deep. Maintain the water garden for 90 days. Prepare a honey super for use on a hive or colony. Remove a filled honey super from the hive or colony and prepare the honey for sale.